Bloodlines: Heart of War by M. Zachary Sherman. A Bloodlines Novel. Review: Wheew! Pop! Boom! These are sounds you usually hear if you are a Donovan. Blood Lines: Heart of War is an action-packed, thrilling set of stories. The Donovan family is depicted from 1938-2011 as different generations of family members engage in war. M. Zachary Sherman tells stories of courage, strength and bravery. This book includes 7 members of the Donovan family. In WW2, Michael is a paratrooper on D-Day and Aaron is a saboteur. In the Korean War, Everett is a captain in the Marines and Tony is an engineer who must repair a vehicle to get his fellow soldiers to safety. In the Vietnam War, Verner is an air force pilot supporting the Marines, and Anne is a medic in the nurse corps. Lester is a Navy SEAL serving in Afghanistan and later the Iraq War. 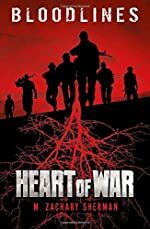 I rate Blood Lines: Heart of War five stars out of five. I think this deserves five stars because it was full of action, so it wasn't completely anti-climactic. This action is appealing to me because my interest in military history. To add to that, there is a sense of family tradition when they go into combat. I like that the Donovans go into the armed forces because of their ancestors, and they do it without complaining, and even when it isn't required. Finally, I learned that warfare is more complex than just two men fighting. This book reveals the truth; you might not even have essentials like food, or water. All in all, Blood Lines: Heart of War appeals to ages ten and up because of violence. We would like to thank Media Masters Publicity for providing a copy of Bloodlines: Heart of War for this review. Have you read Bloodlines: Heart of War? How would you rate it?